Turtles are timeless, known for their protective shell that they carry around on their back, as well as their toothless beak. However, scientists discovered an ancient turtle fossil that walked on Earth 228 million years ago, that reveals how modern turtles evolved. While the turtle fossil had its toothless beak, there was no shell to hide in to protect it from predators. The turtle had its Frisbee-shape body, although its ribs didn’t extend to develop a shell, familiar on turtles today. 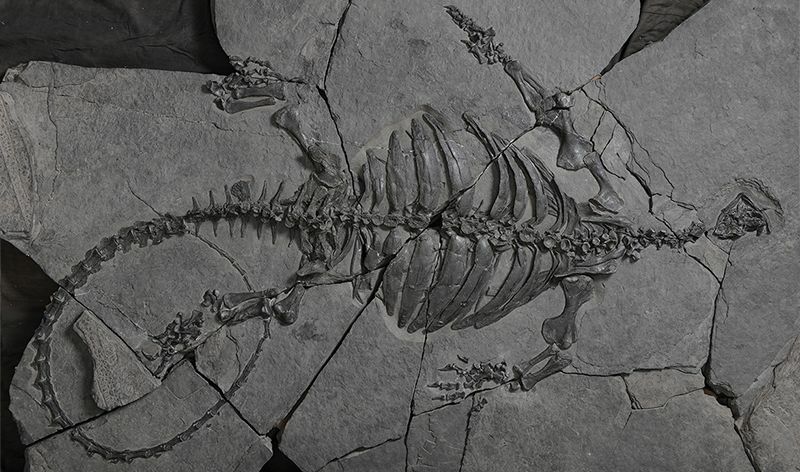 They named the newly discovered ancient turtle fossil Eorhynchochelys sinensis. The name itself is pretty straightforward – Eorhynchochelys means “dawn beak turtle,” or the first turtle that has a beak, and sinensis means “from China,” since the lead author Li Chun of China’s Institute of Vertebrate Paleontology and Paleoanthropology discovered it in China. Eorhynchochelys is one kind of early turtle that scientists have discovered so far. There is also another turtle with a partial shell but no beak. That said, scientists can’t figure out how these different turtle ancestors fit into the reptile family tree. The early developed beak on the newly discovered turtle, before other ancient turtles, is evidence that turtles have a mosaic evolution. Mosaic evolution is the idea which suggests that different traits can evolve independently from each other, and at different rates. Additionally, not every species has a fixed combination of traits that would develop. Turtles that we see today in nature, have developed both shells and beaks, although they didn’t get to that stage in a straight line. While some turtle relatives had partial shells and no beaks, other had beaks but no shells. Anyhow, the genetic mutations that are responsible for modern turtles today happened in the same animal. After years of studying turtles, scientists weren’t sure if the turtle ancestors fell into the same reptile group as modern lizards and snakes – diapsids. Thanks to the studying of Eorhynchochelys’ skull, scientists found that there are signs of it being a diapsid. “With Eorhynchochelys’s diapsid skull, we know that turtles are not related to the early anapsid reptiles, but are instead related to evolutionarily more advanced diapsid reptiles. This is cemented, the debate is over,” Rieppel said. The discovery of the ancient turtle fossil and the team’s findings will reveal how turtles managed to develop their status as diapsids, and is going to change how scientists think of this animal branch.